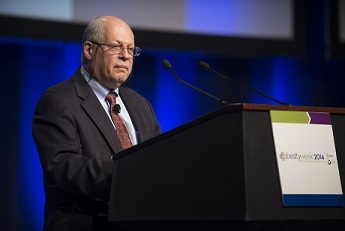 James S. Marks, MD, MPH, from the Robert Wood Johnson Foundation (RWJF) delivered Wednesday's keynote address titled "Catalyzing Social Change for Health: Childhood Obesity." A former Director of the U.S. Centers for Disease Control's National Center for Chronic Disease Prevention and Health Promotion, Dr. Marks spoke about how RWJF came to embrace obesity as a major issue and how it seeks to strategically create culture change, specifically for the benefit of children's health. Noting that millions of Americans live in environments where healthy personal choices are impossible to make, Dr. Marks said that early on it was clear to RWJF that addressing pediatric obesity would require a host of strategies, including many outside clinical care. He outlined the spectrum of healthy food and physical activity programs that have fueled downward trends in childhood obesity in both New York and Philadelphia. "These two cities make it clear that if a city makes these changes, their children will get healthier," he said. Emphasizing that there is much more to be done, Marks described key future initiatives at RWJF including closing disparity gaps, bringing increased attention to pregnant women and young children, building public interest in demanding healthy changes, and fostering partnerships between the health care sector and social services. Regarding the relationship between RWJF and scientific researchers, Marks asserted that the value of science is only related to how widely it is applied. "What if you want your science to matter? We want it to matter a lot, and it will matter a lot of it reaches every community in need and the changes last." JAMA and TOS have enjoyed a productive relationship resulting in a substantial increase in obesity-related articles published in the journal. JAMA has supported TOS in disseminating clinically important information about obesity management to the nearly 1 million readers of JAMA per week, most of whom are primary care providers. In recognition of ObesityWeek, JAMA published two key articles for obesity treatment in this week's edition. A review by former TOS president, Thomas Wadden, PhD, and colleagues, "Behavioral Treatment of Obesity in Patients Encountered in Primary Care Settings: A Systematic Review," summarizes behavioral treatment of obesity with specific emphasis on how this relates to Medicare reimbursement for obesity management. There is also a summary written by TOS and ASMBS member Bruce Wolfe, MD, and Steve Belle, "Long-term Risks and Benefits of Bariatric Surgery: Research Challenge," of a JAMA Surgery paper, "Long-term Outcomes of Bariatric Surgery: A National Institutes of Health Symposium," summarizing the results of last year's NIH obesity surgery workshop. These papers and two others on obesity (see author links below) are available for free during ObesityWeek for meeting attendees. We look forward to seeing you at the JAMA Symposium today at 5:15pm in room BCEC 257AB. There will be presentations from the authors of three recent JAMA papers related to obesity treatment (Nancy Puzziferri, Charles Billington and Bruce Wolfe). Check your registration bags for copies of JAMA's special weight management edition published on Sept. 3, 2014. Want a chance to see three expert bariatric surgeons performing live procedures? Come to a live broadcast of bariatric surgery to ObesityWeek for all scientific session attendees. The Live Bariatric Surgery Telecast will be in the BCEC Ballroom this morning at 8am. Moderators Daniel M. Herron, MD and Aurora D. Pryor, MD, along with panelists Kelvin D. Higa, MD and Archana Ramaswamy, MD, will guide the room through three live surgical procedures, broadcast live on three dedicated high-quality video streams. Gregory F. Dakin, MD, John J. Kelly, MD, and Vivek Prachand, MD, will perform each of the live surgeries. Join ASMBS for three concurrent live procedures with feedback and commentary! TOS Secretary-Treasurer and Atkinson-Stern recipient Martin Binks, PhD, FTOS, took a step to support the future of obesity research and treatment with the creation of an all-new travel grant for ObesityWeek open to all early career members. Dr. Binks will be reallocating his $1000 award, and adding an additional $1000, to help fund two students for their travel expenses to ObesityWeek. 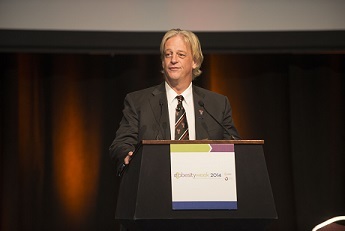 Dr. Binks announced the new award, Bench to Bedside Early Career Travel Grants, during TOS Awards Ceremony on Wednesday at ObesityWeek where he was awarded the Atkinson-Stern Award for Distinguished Public Service. Congratulations to Katelyn Gettens, a graduate student at the University of Connecticut, and Pia Villarroel, a nutritionist at the Universidad de Chile, who were randomly selected for the award. "Early-career members are a priority for TOS, and I'm pleased to be able to contribute these funds this year, and in years to come, to support the future of obesity research and treatment," said Dr. Binks. "This new grant offers opportunities for all early-career members. It is designed for those who do not yet have the research data that is required to compete for the existing travel grants. Addressing obesity requires an integrated, multipronged approach from all areas — including clinical, public health, policy and research — and these grants are intended to provide opportunities across that spectrum." MBSAQIP Town Hall: Bring your questions! The MBSAQIP Town Hall is your chance to ask your questions about MBSAQIP in an open forum. ASMBS' panel of experts including guidelines, accreditation, surgeons, data collectors, statisticians and more are available to answer your questions. Join our panel today at 10:00am in the BCEC Ballroom. If you have more questions about MBSAQIP, you can also ask questions at the MBSAQIP booth in the ASMBS Resource Center. Find MBSAQIP information from 8:00am - 5:00pm, located across from room 209. New research unveiled today at ObesityWeek suggests that high- and normal- protein diets are tied to higher metabolism and 45% more storage of lean tissue, or muscle mass, versus fat when compared to low-protein diets. Further, it shows that this increase in metabolism tied to a high-protein diet is not sustainable when changing to a normal-protein diet, suggesting that the human body cannot be trained to maintain a higher metabolism. TOS recognized lead author Elizabeth Frost for this study by naming her as a finalist for the Ethan Sims Young Investigator Award, an annual award given to five young researchers to cover travel expenses associated with TOS's annual meeting. All five winners presented their research during a session today in competition for the final award — a $1,000 cash prize. For more information, read the press release online. New research from TOS unveiled at ObesityWeek shows that when employers offered financial incentives, employees were 33 times more likely to participate in telephone health coaching, and did so sooner, than employees without incentives. Telephone health coaching — one-on-one phone calls with a personal health coach — is one of myriad employee wellness programs that employers and insurers can offer today. With all that goes on in the workplace, employee wellness programs can sometimes go unnoticed; however this new research shows that adding an incentive can drastically change participation numbers, thus leading to a potential increase in overall health and a decrease in costs for health plans. The findings will be presented during an oral presentation tomorrow, Nov. 7, in BCEC – 253C. 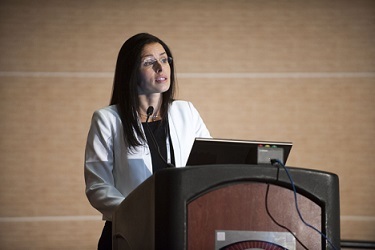 "Weight bias is interfering with our efforts to effectively address obesity," said Rebecca M. Puhl, PhD, during the ASMBS Integrated Health Keynote on Tuesday. The Deputy Director of the Rudd Center for Food Policy and Obesity at Yale University, Puhl said that negative attitudes about excess body weight are rarely challenged and have become so socially acceptable that even healthcare providers are not immune to them. In fact, in one survey of women, doctors were the second most common source of interpersonal weight stigma reported (second only to family members). Puhl explained that the ways people cope with weight stigma can contribute to obesity, and in fact, a large body of evidence shows that such stigma is actually associated with the likelihood of becoming obese. Binge eating, physiological stress and negative feelings toward exercise are some of the consequences that can increase the likelihood of obesity. We also know that patients who have experienced bias from healthcare providers often delay and cancel healthcare services, particularly preventive care. In addition, weight stigma has implications for those seeking weight loss surgery; those who lose weight through surgery are perceived as more lazy and less competent than those who lose weight though diet and exercise, and patients with internalized stigma have been shown to lose less weight after surgery. Faced with what Puhl called our "culture of blame and shame," what can healthcare providers do? She challenged providers to examine how their implicit biases may be affecting how they communicate with patients, including not only their words, but also their body language, facial expressions and spatial distance. She mentioned that the STOP Obesity Alliance tool released this week can help address providers' uncertainty on how to initiate empowering and sensitive conversations with patients about their weight. Find the tool here. Are we, as obesity researchers and health professionals, perpetuating negative stigmas and prejudice against individuals with obesity? At ObesityWeek 2013, Dr. Tomiyama and colleagues surveyed attendees with measures of implicit and explicit weight bias, to answer this very question. This research replicates a study by Schwartz et al., which measured weight bias at The Obesity Society's annual conference over a decade ago, in 2001. Conference participants (n = 232) answered questions about conscious attitudes toward weight to measure explicit bias and completed the Implicit Association Test to measure implicit bias, or unconscious attitudes about weight. Participants at ObesityWeek 2013 displayed significant explicit and implicit anti-fat biases. These participants associated people who with obesity or overweight with more negative traits, including the labels "lazy," "stupid," and "worthless." A comparison between findings from the 2001 study found that implicit weight bias decreased from 2001 to 2013 but that explicit weight bias increased. This increase in explicit weight bias is worrisome because it suggests a permissive social climate in which anti-fat bias is the norm. Negative attitudes about individuals with obesity held by the very researchers and health professionals who are trying to help them may hinder treatment. However, the authors are optimistic about the decrease in implicit weight bias and possibilities to further reduce bias and improve treatment. Congratulations to Monday and Tuesday's Pedometer Challenge Winners! At ASMBS and TOS, we do our best to subscribe to the idiom "practice what you preach," which is why we are taking steps to improve and sustain the health of ObesityWeek attendees. The ASMBS vs. TOS pedometer challenge adds a dose of healthy competition for both groups. Today each attendee's cumulative steps will be added up, and the top 10 attendees with the most steps will vie for the grand prize for a weekend stay at Canyon Ranch. There has been compelling evidence that increased consumption of sugar is associated with obesity. The Obesity Society reported that adult consumption of added sugars has shockingly increased by greater than 30 percent over the past three decades in the United States. New research has showed that more and more of the non-nutritive calorie source of added sugar has worked its way into the American diet over the past three decades. 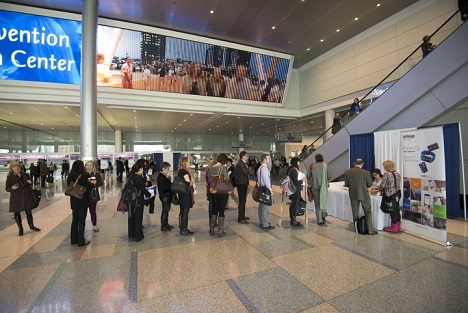 Signs of new growth in obesity treatment options are appearing at ObesityWeek 2014 in Boston this week. Novo Nordisk presented a sweeping scope of results from clinical trials with its drug, liraglutide, which is awaiting final approval from FDA. Researchers are presenting new data for other obesity treatments &mdah; lorcaserin, bupropion/naltrexone, and phenteramine/topiramate &mdah; that fill in the picture of risks and benefits for these products. An important addition to the "eat less, move more" strategy for weight loss lies in behavioral counseling to achieve these goals. But research on how primary care practitioners can best provide behavioral weight loss counseling to obese patients in their practices — as encouraged by the Centers for Medicare and Medicaid Services — remains slim, according to a systematic review of this topic published in JAMA. The study was led by researchers from the Perelman School of Medicine at the University of Pennsylvania. Some simple, 30-second distraction tasks could help reduce cravings, even for your favorite foods, according to a new study. In the study, Richard Weil, M.Ed. CDE, the director of the Weight Loss Program at Mount Sinai St. Luke's Hospital in New York City, tested the effects of three short distraction tasks plus a control task on 55 obese male and female participants. Some simple, 30-second distraction tasks could help reduce cravings, even for your favourite foods, according to a new study. In the study, Richard Weil, M.Ed. CDE, Director of the Weight Loss Program at Mt Sinai St. Luke's Hospital in New York City, tested the effects of three short distraction tasks plus a control task on 55 obese male and female participants. Today, new data from the phase 3a SCALE Obesity and Prediabetes trial were presented at ObesityWeek 2014, the 2nd Annual Congress of The American Society for Metabolic and Bariatric Surgery and The Obesity Society. 92 percent of trial participants lost weight with liraglutide 3 mg treatment, in combination with diet and exercise, compared with 65 percent on placebo treatment. Intensive behavioral counseling can help patients lose a significant amount of weight, but it's rarely delivered by primary care doctors, researchers reported here. In a meta-analysis, patients who had counseling achieved a maximum weight loss of 6.6 kg (about 14 lbs), compared with a top loss of about 2 kg (about 4 lbs) for those who did not participate in such programs, reported Thomas Wadden, Ph.D., of the University of Pennsylvania in Philadelphia, and colleagues here at ObesityWeek and simultaneously online in the Journal of the American Medical Association. At ObesityWeek 2014, Andrew Brown presented an elegant analysis of people first language in asthma, autism, diabetes and obesity. He used Google Books nGram Viewer to examine how frequently people first language has been used over time in various conditions. His analysis shows that when it comes to putting people first, obesity is last.